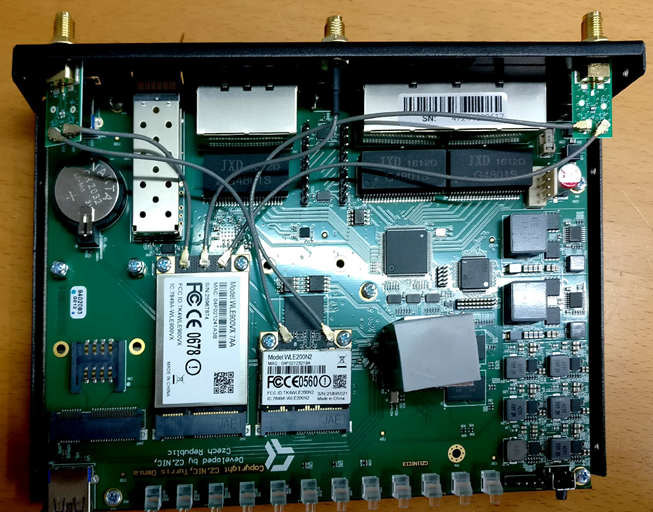 I have one of the first Turris routers Model RTR0M01 and I thought that I would upgrade the wifi to include 5GHz… So I went off to Discomp and bought the additional card and pigtails etc. When I opened by router I discovered the attached. This is nothing like the instructions provided for the upgrade !! I’m not sure what do you need - there was 5GHz card already, no? so the problem is that your’s not working or you just didn’t enable it till now? Edit: I’m sorry. I didn’t mean to frighten you. My idea was, that you found some thread here on the forum. Then you gave a lot of time and effort to translate and hand picked the components. Please, accept my apology. As I’ve read somewhere here „We have documentation for this (because you have Turris 1.x you should be Czech speaking)“. Ok, so turris says that there are two versions of the router… A 1.0 and a 1.1… What have I got then? Is it a Chinese ripoff? What do I do now? Throw it away? I do not want to use an unsupported device. That’s the Turris Omnia, so it’s neither 1.0 nor 1.1 (the Omnia still only has one hardware revision) - I believe the 1.x routers are pretty similar to eachother, but the Omnia is quite different. It is, however, newer, so it’s definitely supported. No you have turris omnia, not any ripoff… to make it more clear. Almost 3 years ago when whole Turris began, there was 1000 router built and distributed to 1000 volunteers in Czech Republic they have Turris 1.0 (We had contract with CZ.NIC renting us these routers for 2 years and we sending network stats back to CZ.NIC, now after two years we can buy routers so we dont have contract with CZ.NIC, we can disable data collection and routers is ours). Year and half later there was another 1000 routers again for volunteers in Czech Republic with same contract this is Turris 1.1 (they have some HW tweeks like usb 3.0 etc). You have Turris Omnia, newest version available to anyone around the globe who will pay for router. You have already two wifi cards one for 2.4ghz and second for 5ghz, you dont need upgrade kit. Guys! Thank you for taking the time to explain all this to me. I guess the web site is not up to date. The omnia has been available for a long time long time now, and should be UP there on the web site. As it is not, I assumed I must have a 1.0 or 1.1 and as a result ordered the upgrade kit. What a waste of money and all unnecessary. What module did you buy? The Discomp kit with the additional card and pigtails etc.